Who is Gay or Lesbian or Bi or Whatever . . .
And Who Should Be, Whether They Are or Not! We're here. We're peculiar. Get used to it! Lord of the Rings, directed by Peter Jackson, (c)2000 by New Line Pictures. To quote Charlie Brown: *sigh* . We don't know if Gandalf was Gay or not, but we are amazed that after he starred in the highest grossing motion pictures of all time and did hundreds, if not thousands of interviews, people are still asking if Sir Ian McKellen is Gay. DOH! What does it take to convince you people? That we should tell you, because we are never wrong? Okay, then! Sir Ian McKellen is Gay. He's a card-carrying Friend of Dorothy. The Muse With The Jaundiced Eye hath spoken, so it must be true! We asked this question as a "teaser" in 1999, on our original Geocities homestead, but the Yahoo!kuza locked us out of our site before we could answer it, and there the question still hangs in Yahoo-cyber-hell, with cutie-pie Jordan's picture. . . .
Well, now that Speedway Junky has finally opened in the U.S. and we have actually met Jordan, the answer to the Big Question is: no, Jordan is not Gay. 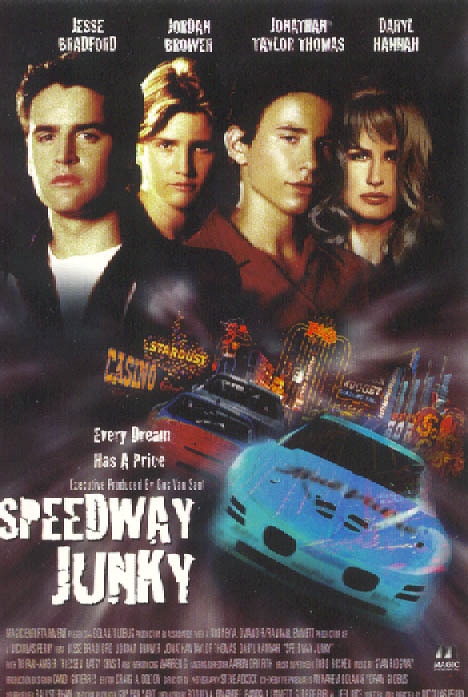 He does a good job playing love-struck Gay teen prostitute Eric in Speedway Junky, though. Now that we have actually met him, we can also add that he is one heck of a nice guy, too. And, yes, girls, he does look as cute in person as he does in photos. (blush). Steven Cozza Photo source: The Cozza Family. From The Advocate, May 22, 2001. Interview and pertinent photographs (c)2001 by Liberation Publications. As is the case with just about any person who stands up for Gay and Lesbian rights, Eagle Scout Steven Cozza, who started Scouting For All when he was just twelve years old, has been said to be Gay. Is he? Here's the word, Girls: the teen cutie from Petaluma, California, who has appeared before the U.S. Congress, been the subject of a documentary film, etc., etc., is, by all accounts, as straight as the proverbial arrow. In an interview with John Gallagher which appeared in the May 22, 2001 issue of The Advocate, Steven explained that he started Scouting For All (which does not discriminate on the basis of religion or sexual orientation as the Boy Scouts of America do) because his father had pointed out to him that family friend Robert Espindola (who is Gay) would be barred from Scouting in the U.S. because of the rules of the Boy Scouts of America. (Readers in Europe and other countries may find this ridiculously unbelievable, but it's the truth in the U.S.A.) Angry, Steven started Scouting For All so that all boys would have an opportunity to experience Scouting. As for being Gay himself, however, by all accounts, he isn't. On the other hand, what with testifying before Congressional subcommittees, raising lizards to sell for pocket money, Scouting, etc., we haven't heard that he currently has a girlfriend, either, so there is hope for you Girls who live in northern California, or Sacramento, or Washington, D.C., or wherever else Steven's work takes him. Cross your fingers and toes (or whatever other appendages you might think appropriate!) and you just might get lucky! (The Girl Scouts of America, by the way, do not discriminate against any minority groups. We do wonder something, though: why is it that "White" people in the U.S.A. who stand up for the rights of African-Americans are never assumed to be "Black"?! 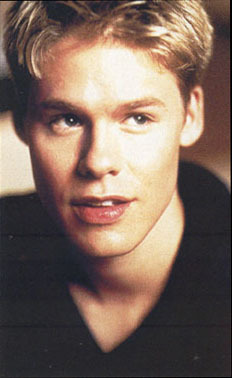 . . . .
Randy Harrison, star of Showtime television's U.S. version of "Queer As Folk" Photo source: Out magazine, January, 2001. (c)2001 by Liberation Publications. In the case of Randy Harrison, though, he is Gay. And "Out." (We had incorrectly reported last week that he wasn't Gay, and we apologize to Mr. Harrison for our error! ARE BARTLEBY AND LOKI QUEER? Very! But not the way you dirty-minded types are thinking, because they are angels and angels don't . . . well, just go see Dogma, and you'll understand. Not only is he not gay, but he isn't terribly festive, either. Kevin Smith, however, auteur of all five "New Jersey Trilogy" movies, DID get a great big kiss on the lips from friend and frequent View Askew star Ben Affleck at the MTV music awards, where they were co-presenters. We'll try to get a picture of that famous kiss for you, in case you missed it. WE ARE UPDATING -- MUCH MORE TO COME!